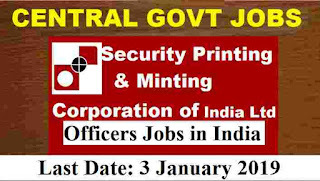 Security Printing & Minting Corporation of India Limited (SPMCIL), a Schedule ‘A’ Mini-ratna Category–I Central Public Sector Enterprise wholly owned by Government of India, started functioning as a Corporatized entity with effect from 13th January, 2006. More information related to these Government jobs in India is given below in this article. 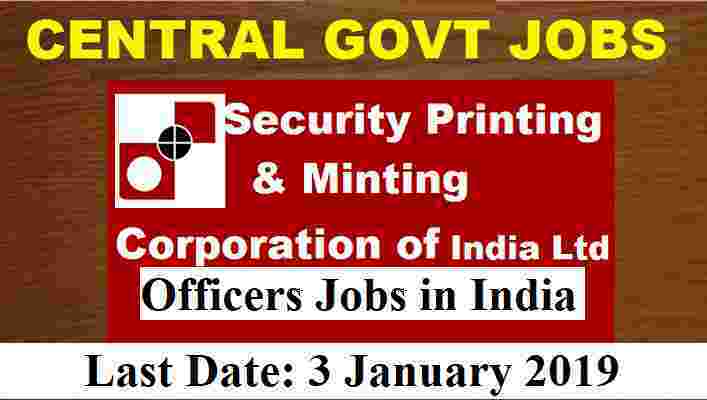 SECURITY PRINTING AND MINTING CORPORATION OF INDIA LTD is looking to recruit fresher Indian candidates for officers posts. Applicants who have a First class degree in Law (Regular course) from Govt. recognized University can apply for these job profile. Those who have following qualification: “MCA/B.Tech (Computer Engineering/IT)” from a recognized University/Institute can apply. Those who have a Master’s Degree in PM &IR/MSW/MBA with HR elective/ MBA in Management with HR elective can also apply. elective equivalent to MBA from recognized University/Management Institute can apply. 1st Class Degree in Engineering in discipline of Mechanical/Electrical/Pulp & Paper Technology/Electronics/Printing. Age Bond: Age of the applicants should be less than 30 years for applying these Government jobs in India. Paying Method: Applicants can pay the Application fee through Debit Card/Credit Card or Net Banking. There is no other method for applying these Government jobs in India. 3rd January 2019 is the Last date to apply.